Football fanatics are known for expressing their madness in some of the craziest and weirdest ways. 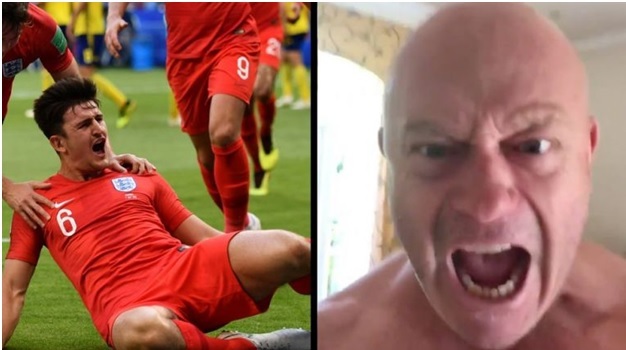 Ross Kemp is one such crazy fan whose bizarre reaction on England’s win became viral on the internet. Kemp shared his excitement through a video on Twitter. Baring nothing on top, Kemp spoke directly to camera. His reaction shows how excited he is on seeing his team making to the Quarter Finals. Here is the video Kemp posted on Twitter. With the video, Kemp tweeted “What a game, what an ending. Well done”. Well, undoubtedly, the match was everything that it could have been to keep the fans on the edge of their seats till the last moment. The fight was tough between England and Columbia as the result was decided by penalty shootout after a 1-1 draw. This win made England to qualify for the Quarter-final. And now as England has even made to the Semi-final after beating Sweden with 2-0 in the Quarter-final, the excitement level of Ross Kemp has gotten more furious. Watch the clips posted by Kemp on Twitter, giving frequent updates following each goal against Sweden. This was the reaction of Ross Kemp when harry Maguire scored a goal in the 30th minute. And when Jordan Pickford saved a goal in the 47th minute, the reaction of Kemp was at its peak. Here is the video posted by him on the twitter. England is going to play the Semi against Croatia on this Wednesday. If England makes it to the final, the reaction of Ross Kemp will be worth to watch.